The federal government of Nigeria is busy exploring the Lake Chad Basin for deposit of fossil fuel. But it appears Nigeria’s Vice President Yemi Osinbajo is not event excited by any possible future discovery of crude in Nigeria. The VP is making a case for Nigeria to use its current oil wealth to prepare for a future without crude. The world is moving past fossil fuel, with some European countries including the UK and France setting deadlines to stop using fuel-powered vehicles. 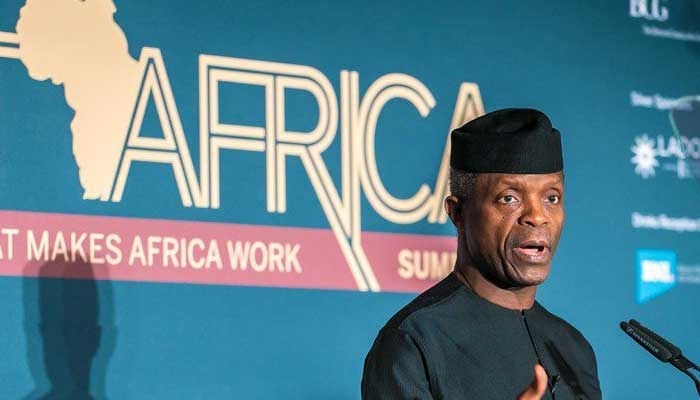 The VP said on Thursday that Nigeria needs to develop renewable energy and help other businesses flourish to “adjust to the reality of the dwindling significance of fossil fuels”. “It is no longer a question of if but when,” Osinbajo said, referring to global efforts to shift away from oil. “Oil-rich countries, such as ourselves, have an obligation to prepare for a destiny that may well be beyond oil,” he told the Oil Producing Trade Section (OPTS) conference in Lagos. Nigeria’s government has long talked of diversifying Africa’s largest economy away from reliance on oil, but earnings from output of crude still provides two-thirds of federal revenue. The vice president called on oil and gas majors in Nigeria, many of them represented in the audience, to invest in renewable energy research and development to help Nigeria prepare for a “clean energy economy” and the “post-oil world”.